“Bird the San Pedro” event at the Holy Trinity Monastery in St David on Saturday, September 22, 7 am–1 pm, please RSVP here. Beautiful grounds, accessible walking trails, and birds galore! Guided, morning bird walks on the grounds, along the San Pedro, Guindani Canyon (Whetstones), Benson area, or St. David Cienega. If you plan to join them on a field trip or walk around the grounds, please RSVP here. The van trips have limited space, so sign up today! 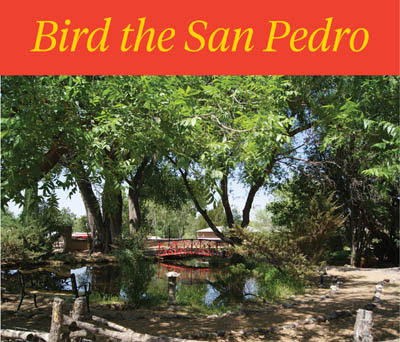 Save the date: We will need 15–20 volunteers at the St. David Monastery during the Bird the San Pedro Event itself. Email Luke Safford at lsafford@tucsonaudubon.org if you’d like to help. Looking for more volunteer opportunities? See more about volunteering with Tucson Audubon here. This entry was posted in Education, Events, Partners, Volunteers by FSPR Admin. Bookmark the permalink.